Wild Places. Shared Adventures. Good food. Fresh stories. Easter in Skaha is becoming a tradition for our family…and every other climber in Western Canada, as we found out this year. Integrated into the BC Provincial Park system less than ten years ago, the Skaha Bluffs keep gaining in popularity as the number of rock climbers in Western Canada grows exponentially year after year. Tucked on the Western slopes of the Monashee mountains just above Skaha Lake near Penticton, the Bluffs offer close to 1000 routes ranging from 5.4 to 5.14. This South Okanagan gem benefits from a warm and dry climate that is unsurprisingly very appealing to warmth-deprived Calgarians escaping the cold and Vancouverites escaping the wet and gloomy. If the destination is popular in the spring and fall, it is known as almost too hot for climbing during the summer months; climbers then have to aim for early morning and evening sessions. I have heard through the great vine, however, that local route setters are currently working on a new north-facing crag…Some winter climbing is also possible sometimes, although the gate to the parking area is usually open from late March to late November. Speaking of vine, the climate in Skaha combined with the nature of the rock are not only benefiting climbers; they are also creating the ideal conditions to grow grapes. The perfect exposition combined to gentle slopes, rocky soil, cutting edge irrigation technology and a local savoir-faire developed over the last thirty years or so make this area one of the best in Canada for producing award-winning wines. Fine wines, great climbing, and decent weather forecast all aligned to guarantee a great time on our Easter getaway. If we’re usually camping on our annual Easter getaway to Skaha, this year we were lucky to benefit from the warm hospitality of my sister Anne and her partner Chris, recently established in Shaka where Chris’s family is from. In addition, our father, Jacques, also decided to tag along for the trip and booked a last-minute flight ticket from Quebec City into Cranbrook to enjoy the road trip with us and a long overdue get-together with my sister and I. Although climbing was obviously on our list, this time we took the opportunity to explore a bit further what Penticton and the Skaha area have to offer in terms of activities for the small and big kids alike. 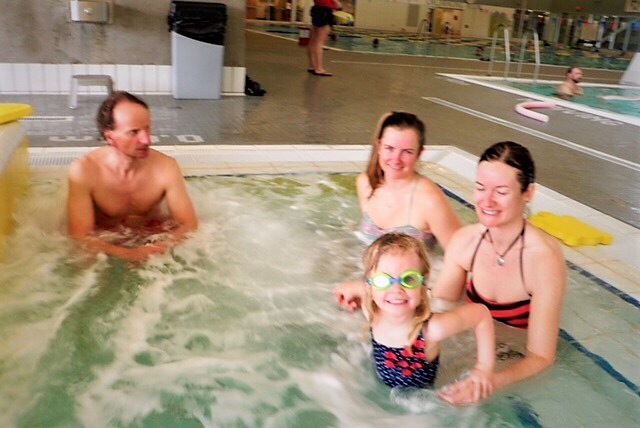 The heavy rain we had on the first morning didn’t put a damper on our spirits and we headed straight for the Penticton Aquatic Centre, auntie, and grandpa in tow. My daughter, who I suspect to be way more interested in swimming than she is in climbing, was in heaven! Penticton, a City of over 40,000, really has an amazing selection of recreation amenities and counts on a state-of-the-art aquatic centre that provided a full morning of fun for everyone, in spite of the mega yellow water slide being out of service. The rain finally stopped around midday and therefore we were able to get out for an afternoon stroll in the gigantic Skaha Lake Park. Rated #1 attraction in Penticton on TripAdvisor, this park located a stone’s throw away from my sister’s place didn’t disappoint. From riding bikes along the lakeshore to building sandcastles on the beach, goofing around on the two playgrounds and feeding the gazillion ducks in the creek, the park was well worth the daily visit. And of course, there was the climbing! We had never seen the Bluff’s parking lot this full, but we still managed to find some routes to kick off the season and spook the crap out of ourselves awaken our senses on the tiny technical ledges. Parents will have to be mindful of ticks early in the season and do a full children and pet checkup at the end of each day. On a long weekend, those who want to tackle specific projects have to get up early to beat the crowd, which my husband and I took turns to do…on some mornings. Another highlight of our stay was the time we spent with Chris’ family around great meals and the chugging tasting of local wines. Paul, Chris’s father took us all on a nice walk along the mountainside to the nearby Pentâge Winery on Easter Sunday. There, we were introduced to Julie Rennie and Paul Gardner, former Vancourites established on their land since 1996. Passionate about their craft and so eager to share their knowledge with their visitors, Julie and Paul grow 19 types of the highest quality grape in small lot releases on their 23-hectares property. In the sleek design tasting room where colourful local paintings contrast with the dark plywood and steel walls, Julie served us a crisp Gewürztraminer, followed by a Sauvignon Blanc and an oak barrel-aged Roussanne-Marsanne-Viognier, which really delighted our privileged group of tasters. We then completed the tasting with a rich Syrah and took our glasses outside on a private tour of the impressive 5000 sq. ft natural rock cellar carved right from the bedrock, which offers the controlled climate required for the French-made oak barrels to operate their magic. Paul the winemaker then took some time out of his busy schedule to share some of his wine-making and travel stories with us…along with some dirty jokes. 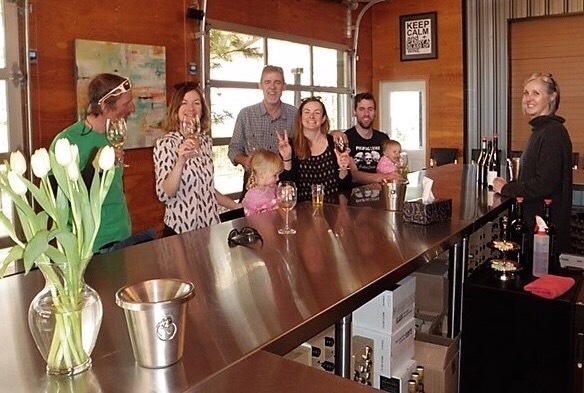 We left the winery with fuzzy heads and a baby stroller heavy with a sleepy child and numerous bottles of Pentâge wine; some of them were consumed that very night, paired with the delicious Easter dinner prepared with love by Sally, Chris’ mother. We departed Skaha the next morning with the skin on our fingers still intact, as this time we didn’t make climbing the core focus of our stay. However, we departed Skaha with our batteries recharged from the great times spent with the family (and extended family) and a bottled sample of Skaha’s terroir in our luggage. Banbury Greens Campground (opens on April 1st) Special early season rates for tenters and small camper vans. Sits on the right side of the lake to get the early morning sunshine. Hot showers, fire pits, and electrical hook-ups. No groceries nor restaurant nearby. The most popular spot for climbers. Bad Tatoo. A craft brewery with a great ambiance and tasty pub fares and healthy dishes at a reasonable price point. The Cannery. The other craft brewery. Excellent beer with the flagship brew being the Muse. Snacks and sandwiches available. Hike the Skaha Bluffs’s Trail and look for bighorn sheep and snakes.